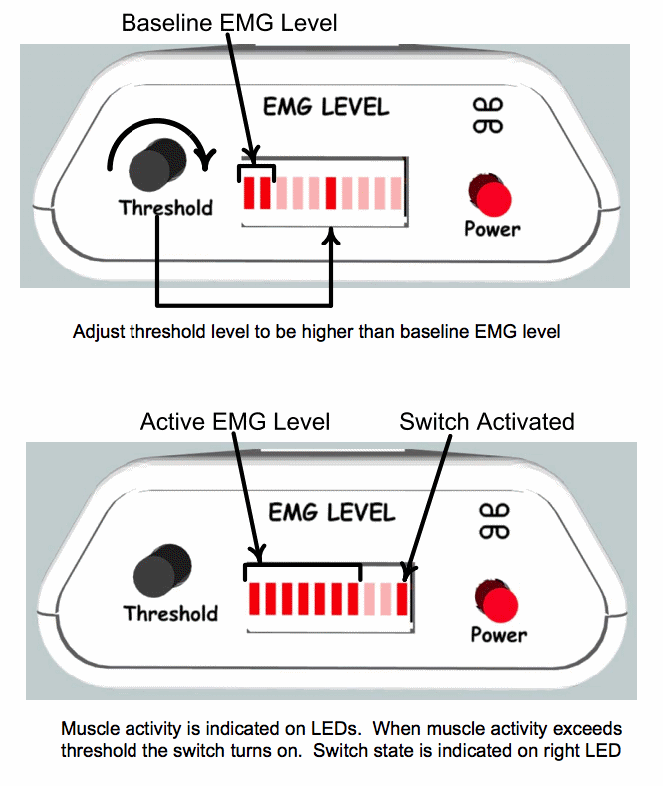 HOW does the EMG Switch work? 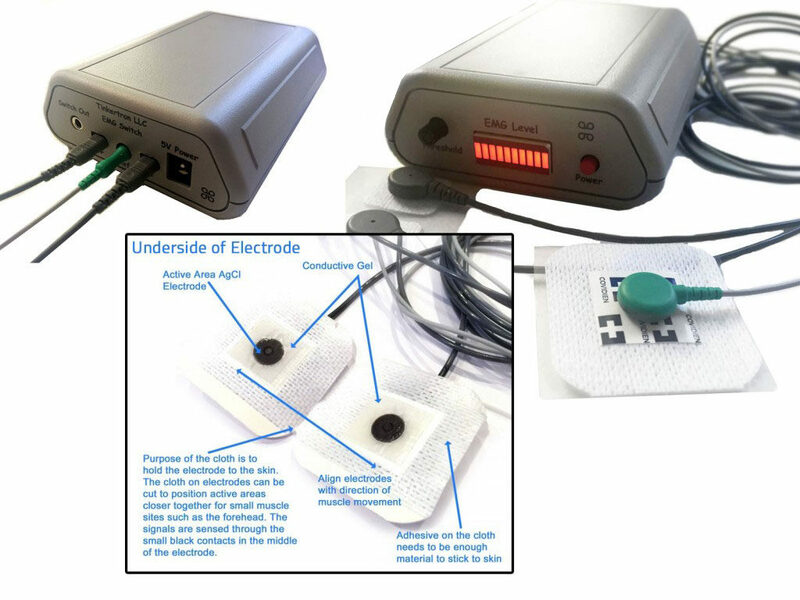 By using tiny electrical impulses from muscle contractions, the EMG Switch is designed to detect and convert electromyographic (EMG) signals which are present on the skin through muscle activity in your body into electrical information that is processed and input into a special switch closure used to output/activate your assistive technology/device such as a wheelchair, keyboard, etc. The input to the EMG switch comes from cloth electrodes, which provides contact to the tiny signals on the surface of the skin. 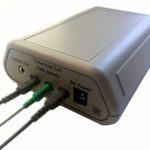 The EMG switch continuously monitors the signal under the electrodes, and when the signal level exceeds a user adjustable threshold, a relay is energized providing an isolated switch closure output. Which muscles can control the EMG switch? Almost any controllable single muscle on the body can be used to control the Tinkertron EMG Switch, such as pectoral muscles, brow muscles, jaw muscles, cheek muscles, and others. How much muscle strength is needed to move the switch? Minimal. Because the EMG Switch is very sensitive, even tiny muscle twitches provide enough electrical signal to be detected and used by the EMG Switch. Will this work with my power wheelchair? The EMG Switch can control most power wheelchairs that accept switch input. What software do I need to install this switch scanner? Your existing software and computer programs are all that is required, as long as they accept switch input. 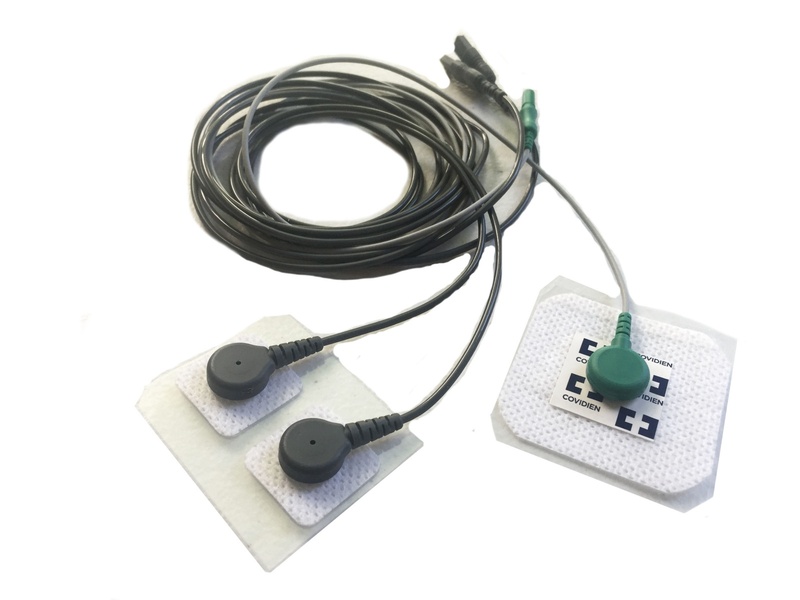 The EMG switch is designed to convert tiny electromyographic (EMG) signals which are present on the skin near muscle activity into a standard switch closure that can be used to activate assistive technology equipment. The input to the EMG switch comes from an active electrode, which provides amplification of the tiny signals on the surface of the skin. 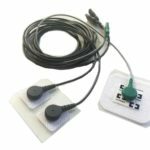 The EMG switch continuously monitors the signal from the active EMG electrode, and when the signal level exceeds a user adjustable threshold, a relay is energized providing an isolated switch closure output. The unit is fully battery powered, and can operate for up to 60 hours on a charge. The internal batteries can be recharged using a wall mounted transformer provided with the unit. There is also now a portable USB battery with wall adapter for convenience & portability. 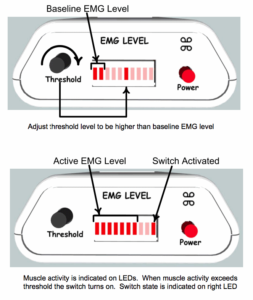 The operation of the EMG Switch is easy! Connect the green reference electrode lead to the rear panel jack labeled REFERENCE. Connect the grey active electrode leads the to the jacks labeled + and -. Connect the SWITCH #1 through a standard 3.5mm cable and plug to the primary assistive technology device to be controlled. Snap the cloth electrodes onto the other end of the electrode leads. Place the reference electrode at some convenient location on the body away from the activation site. Place the active electrodes over the muscle site to be monitored. For very weak muscle activity electrode placement is critical. Observe the muscle twitch and place the electrode near the movement site, orienting the two electrodes in line with the muscle movement. Press the POWER switch to turn the power on. Turn the THRESHOLD knob fully counter clockwise and verify that the SWITCH lamp comes on. Fully counter clockwise corresponds to the lowest threshold setting, and at this setting the switch is closed all the time. Turn the THRESHOLD knob fully clockwise. Clockwise rotation corresponds to the highest threshold setting. At a fully clockwise setting it takes a very large muscle contraction to activate the switch. With the muscle site inactive, gradually turn the knob counter clockwise until the SWITCH light is illuminated. Illumination of the light indicates that the switch is active. With the muscle site inactive turn the THRESHOLD knob slightly clockwise to increase the threshold above noise. Ask the user to activate the muscle site, and verify that the light comes on when the site is activated and that the light goes out when muscle site is at rest. It may take some experimentation to optimize the placement of the electrodes, and to optimize the setting of the THRESHOLD knob. The lower the threshold setting the more sensitive the device is to surface signals. A higher threshold takes a stronger signal to activate the switch and also minimizes the false triggers.